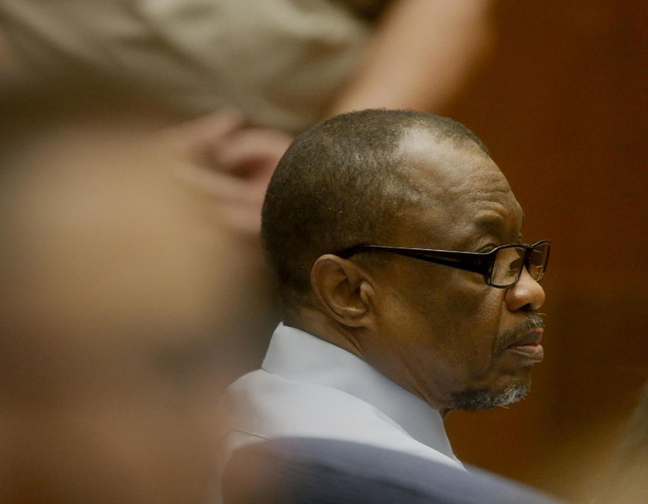 Closing arguments in the trial of the man charged in the "Grim Sleeper" serial killings lurched from a whodunit crime thriller Tuesday to science fiction as attorneys sparred over evidence. Defense lawyer Seymour Amster revealed for the first time in the long-running trial that a "mystery man," an unnamed nephew of defendant Lonnie Franklin Jr., was the real killer. "Each and every murder in this case could have been done by a mystery man with a mystery gun with mystery DNA," Amster said. Deputy District Attorney Beth Silverman shot back during her rebuttal that Amster had concocted an imaginary scenario at the last minute in the face of overwhelming evidence of guilt. "The theory of the defense is basically the equivalent of the skies opening up, a space ship descending and murdering all these women," Silverman said as members in the audience snickered. The lawyers wrapped up two days of closing arguments in Los Angeles Superior Court after months of testimony in the case that spans more than three decades. Jurors are to begin deliberations Wednesday. Franklin, 63, a former garbage man and mechanic for the Los Angeles Police Department, could face the death penalty if convicted of the slayings of a 15-year-old girl and nine young women. He has pleaded not guilty to murder and attempted murder. The killings spanning from 1985 to 2007 were dubbed the work of the "Grim Sleeper" after an apparent 14-year gap in the violence after 1988, when one victim survived a gunshot and escaped. Much of the killing occurred during the crack cocaine epidemic and the killer preyed mostly on young black women, some of whom worked as prostitutes. Several other serial killers were active at the time in South Los Angeles and community members criticized police for not aggressively investigating the slayings because the victims were black and poor. Margaret Prescod, who founded the group Black Coalition Fighting Back Serial Murders, said she and other women weren't taken seriously when they confronted police in 1985. "Why are you concerned about it? He's just killing hookers?" Prescod said she was told. Police and prosecutors believe that the killer had more victims and may not have paused during the apparent hiatus. Photos of nearly 200 women were discovered in Franklin's house after his arrest and some of the women in those photos have never been found. Photos of Janecia Peters, killed in 2007 and the final slaying in the case, and Enietra Washington, the only known survivor, were among the trove of snapshots. Washington's testimony provided the blueprint of how Franklin preyed on women, Silverman said. He lured her into his car, shot her in the chest, sexually assaulted her and then dumped her from the vehicle, Silverman said. The bullet removed from Washington came from the same gun used to shoot or kill seven previous victims, most of whom had Franklin's DNA on them, Silverman said. But Amster said that the case collapsed on Washington's testimony because of inconsistencies in her statements to police. Washington described an assailant who was younger than Franklin and pock marked, Amster said. Amster then introduced the new theme of the defense. He said the real killer had access to Franklin's Ford Pinto and had told Washington he was stopping at an "uncle's house" — believed to be Franklin's — to get money while she waited in the car. "It was not Mr. Franklin," he said. "It was the nephew, this mystery man." Silverman said Amster had distorted the evidence and that Washington's descriptions of Franklin were always consistent. Washington identified a photo of Franklin and she pointed him out in court. She said she was 100 percent sure he was the man who shot her and left her for dead. Amster said prosecutors had built a circumstantial case using inferior science that found the DNA of unknown men on the victims. But Silverman said Amster had twisted the evidence so the expert testimony favored his case when it was convenient and that ballistics evidence or DNA connected Franklin to each victim. "If there is some mystery man out there, how come we didn't pick up his DNA on victim after victim?" she said.